The year began badly with the death of Ray Bolton. Ray played for many years at Steeton as a wicket-keeper / batsman. He won the 1st XI league wicket keeping prize in 1969, the 2nd XI league wicket keeping prize in 1983 & the league batting prize in 1984, as well as a number of club prizes. For the previous 7 years the 1st XI captaincy had been shared between Jon Best & Neil Spragg, but this season broke the mould and brought in some ‘young blood’ in the guise of Stephen Pearson. New skipper Stephen was able to persuade 3 of his cousins to join Steeton CC from Keighley CC: Freddie Pearson, Tom Stead & Joe Stead. All 3 players had played for Steeton juniors. The Club also welcomed new recruit James Freebury from Upper Wharfedale. With an inexperienced skipper and so many new players to mold into a team, this was always going to be a difficult season. Overseas player was Australian Max Tomkinson, who disappointingly only scored 197 runs at an average on just over 16.4 with a top score of just 30, before he announced mid-way through the season that he was leaving the Club to transfer to Tickhill Cricket Club in the South Yorkshire Cricket league. In a tough division the Club is very pleased that our 1st XI finished in 10th place and secured 1st division status for 2016. Disappointingly Steeton lost in the 1st round of the Waddilove cup at Ilkley. With an average of just over 28 and top score of 99*, Andrew Foulds again won the Club’s 1st XI batting award. With 27 wickets at an average of 25, James Emmott narrowly beat Joe Stead to the Club’s 1st XI bowling award. Steve Pearson was again a worthy recipient of the Club’s 1st XI fielding award with 13 catches. Jon Best emigrated to Jersey at the end of the season & Neil Spragg announced his ‘early’ retirement, so next season the 1st division survival may prove to be even more difficult! With the retirement of 2nd XI stalwarts Mick Wilson & Julian Higginson this was expected to be a difficult season. New 2nd XI captain Craig Walton took the helm. The league form was good, but a struggling 1st XI depleted of players due to injuries, poor form, desertions…and the occasional rock concert, meant that in-form 2nd XI players were called-up for 1st XI duty. The 2nd XI finished in an excellent 3rd place the 1st division. Steeton had reached the Birtwhistle Cup final before on 6 previous occasions – 2012, 2009, 2006, 2004 & 1996 – but 2015 became the first time we have lifted the cup. Our 2nd XI won the Birtwhistle Cup Final with a comfortable 7-wicket victory against Guiseley at Horsforth Hall Park. Craig Walton was the Man-of-the-Match. Our 2nd XI recorded a remarkable 7 centuries, with 4 for Chris Luxton & 3 for skipper Craig Walton. Chris Luxton (138) & Craig Walton (136*) also set a new Club record 2nd wicket partnership of 283 runs in the home Birtwhistle Cup fixture against Skipton CC. Both Chris & Craig finished with excellent batting averages, but with 1,079 runs at an average of 77 Craig secured the Club’s 2nd XI batting awards. The Club’s 2nd XI bowling award was also keenly contested, but was won by Paul Hardwick with 30 wickets at an average of 17.6. Veteran Phil Barrett was awarded the 2nd XI Club fielding award with 12 catches…mostly taken in the slip cordon. Special mention must also be made of Gary Boulton, who had a great all-round season scoring 539 runs & taking 50 wickets…not bad for a 50 year old! Our 3rd XI was captained by Hayden Tennant, who did a fantastic job for the Club bringing on our young talent into open-age cricket. 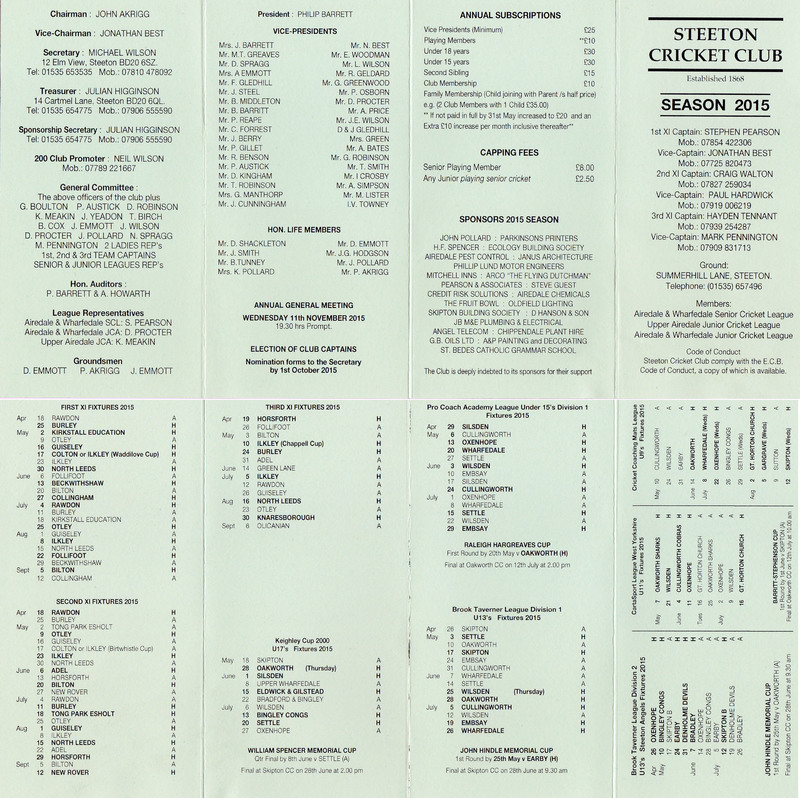 Steeton finished in 9th place in the league, having finished the ‘wrong side’ of some very close finishes. It was in the Chappell cup however where Steeton flourished as they reached the final. Our 3rd XI won through to the Chappell Cup Final but lost in the final against Burley-in-Wharfedale at Green Lane. Steeton have now reached the final on 3 occasions in 2015, 2006 & 2004, but have never yet lifted the cup. Steeton 3rd XI recorded 3 centuries: Hayden Tennant scored 109 in the Chappell Cup against Ilkley, junior Ryan Birch scored 107* not out in the Chappell Cup against Adel, and Hayden Tennant also scored 106 at Follifoot. Hayden Tennant easily won the 3rd XI batting prize with an average of almost 53; and was also extremely effective with the ball…Hayden took 23 wickets with a average of 9.3 to also win the Club’s 3rd XI bowling award. Hayden’s young son Mikey Hofman-Tennant was awarded the 3rd XI Club fielding award. Hayden Tennant won the League Batting Award & Ryan Birch won the League Wicket-Keeping Award. Our U17s finished in a creditable 3rd place in the league. Our under 17s also had the only 2 batsmen to qualify for the league averages: Bradley Akrigg won with an average of 102, while Will Rankin was runner-up. Thomas Meakin took 10 league wickets – the 2nd most in the league. Ryan Birch came joint first in league wicket-keeping award. Our U15s had a great season finishing as league champions. Aatif Modak won the league averages an average of 139. Our 15s reached the quarter-final stage of the Raleigh Hargreaves cup. Our U13s had a good season finishing as runners-up in the league, but had a great cup run – winning the John Hindle Cup by beating Skipton in the final.Owen Narey is an excellent prospect having won both the Club’s batting & bowling averages (as well as the U15s bowling). Owen Bridge came 2nd in the league wicket-keeping award. Our U11s finished in a creditable 3rd place in their Conference. Max Hibbert finished in 2nd place in the league batting averages & won the league wicket-keeping award. Our U9s finished in 5th place in the league – winning as many games as they lost. The year ended with the 4th annual ‘adult’ pantomime – an unusual re-telling of Dicken’s Christmas Carol called ‘Scrooged’ organised by Julian Higginson. Congratulations to all the participants.